Lee Buck Trevino (born December 1, 1939) is a retired American professional golfer who won six major championships over the course of his career. He is one of only four players to twice win the U.S. Open, The Open Championship and the PGA Championship. The only major that eluded him was the Masters. He is an icon for Mexican Americans, and is often referred to as "The Merry Mex" and "Supermex," both affectionate nicknames given to him by other golfers. Born in Dallas, Texas, into a family of Mexican ancestry, Trevino was raised by his mother, Juanita Trevino, and his grandfather, Joe Trevino, a gravedigger. Trevino never knew his father, Joseph Trevino, who left when his son was small. Trevino's childhood consisted of attending school occasionally and working to earn money for the family. At age 5, he started working in the cotton fields. Trevino was introduced to golf when his uncle gave him a few golf balls and an old golf club. He then spent his free time sneaking into nearby country clubs to practice, and began as a caddy at the Dallas Athletic Club, near his home. He soon began caddying full-time. Trevino had to leave school at 14 to go to work. He earned $30 a week as a caddy and a shoeshiner. He was also able to practice golf, since the caddies had three short holes behind their shack. After work, he would hit at least 300 balls. When he turned 17 in December 1956, he enlisted in the United States Marine Corps, and served four years as a machine gunner and was discharged in December 1960 as a Corporal with the 3rd Marine Division. Part of his time was spent playing golf with Marine Corps officers. Trevino claims being a golf partner helped earn him promotion to lance corporal. He played successfully in Armed Forces golf events in Asia, where one rival was Orville Moody, who would follow Trevino to the PGA Tour in the late 1960s. After his discharge, Trevino became a club professional in El Paso, Texas, and made extra money by gambling for stakes in head-to-head matches. He qualified for the U.S. Open in 1966, made the cut, and tied for 54th, earning $600. He qualified again in 1967 and shot 283 (+3), eight shots behind champion Jack Nicklaus, and only four behind runner-up Arnold Palmer. Trevino earned $6,000 for finishing fifth, which earned him Tour privileges for the rest of the 1967 season. He won $26,472 as a rookie, 45th on the PGA Tour money list, and was named Rookie of the Year by Golf Digest. The fifth-place finish at the U.S. Open also earned him an exemption into the following year's event. Trevino had a remarkable spell during a span of 20 days in the summer of 1971. He defeated Nicklaus in an 18-hole playoff to win the 1971 U.S. Open. Two weeks later, he won the Canadian Open (the first of three), and the following week won The Open Championship (British Open), becoming the first player to win those three titles in the same year. Trevino was awarded the Hickok Belt as the top professional athlete of 1971. He also won Sports Illustrated magazine's "Sportsman of the Year" and was named ABC's Wide World of Sports Athlete of the Year. In 1972 at Muirfield in Scotland, Trevino became the first player to successfully defend The Open Championship since Arnold Palmer in 1962. In a remarkable third round at Muirfield, Trevino had five consecutive birdies from the 14th through the 18th, holing a bunker shot on the 16th and sinking a 30–foot chip on the 18th for a round of 66. In the final round, Trevino was tied for the lead on the 17th tee with Tony Jacklin. Trevino chipped in from rough on the back of the green for a par on the 17th. A shaken Jacklin three-putted the same hole from 15 feet for a bogey. Trevino parred the 18th hole for a final round of 71, winning him the Open by a stroke over Nicklaus, with Jacklin finishing third. Trevino holed out four times from off the greens during the tournament. Nicklaus had won the first two majors of the year and fell just short in the third leg of the grand slam. After holing his chip shot on the 17th in the final round, Trevino said: "I'm the greatest chipper in the world." In the PGA Championship in 1974, Trevino won the fifth of his six major championships. He won the title by a stroke, again over Nicklaus, the fourth and final time he was a runner-up in a major to Trevino. At the Western Open near Chicago in 1975, Trevino was struck by lightning and suffered injuries to his spine. He underwent surgery to remove a damaged spinal disk, but back problems continued to hamper his play. Nevertheless, he was ranked second in McCormack's World Golf Rankings in 1980 behind Tom Watson. Trevino had 3 PGA Tour wins in 1980 and finished runner-up to Tom Watson in the 1980 Open Championship. At the age of 44, Trevino won his sixth and final major at the PGA Championship in 1984, with a 15-under-par score of 273, becoming the first player to shoot all four rounds under 70 in the PGA Championship. He was the runner-up the following year in 1985, attempting to become the first repeat champion since Denny Shute in 1937. In the early 1980s, Trevino was second on the PGA Tour's career money list, behind only Nicklaus. From 1968 to 1981 inclusive, Trevino won at least one PGA Tour event a year, a streak of 14 seasons. In addition to his PGA Tour victories, Trevino won more than 20 international and unofficial professional tournaments. He was one of the charismatic stars who was instrumental in making the Senior PGA Tour (now the Champions Tour) an early success. He claimed 29 senior wins, including four senior majors. He topped the seniors' money list in 1990 and 1992. From 1983 to 1989 Trevino worked as a color analyst for PGA Tour coverage on NBC television. In the 1989 Masters, at the age of 49, Trevino shot an opening five-under-par round of 67 to become the oldest man ever to lead the field after a round in the tournament. It came despite Trevino's words 20 years earlier, when he said after the 1969 Masters: "Don't talk to me about the Masters. I'm never going to play there again. They can invite me all they want, but I'm not going back. It's just not my type of course." Trevino said that he felt uncomfortable with the atmosphere at the Augusta National club and that he disliked the course because his style of play, where he liked to fade shots left to right, was not suited to the course. Trevino boycotted the Masters in 1970, 1971 and again in 1974. In 1972, after boycotting the previous two Masters tournaments, he stored his shoes and other items in the trunk of his car, rather than use the locker room facilities in the clubhouse. Trevino complained that had he not qualified as a player, the club would not have let him onto the grounds except through the kitchen. But he later described his boycotts of the Masters as "the greatest mistake I've made in my career" and called Augusta National "the eighth wonder of the world." His self–taught style, distinguished by an out-to-in swing designed to fade the ball (which he devised to combat a chronic hook), led to many exciting shots and skins game victories. He used an open stance and a strong grip, was never a long hitter, but was renowned for his accuracy under pressure, as well as a very creative short game. Trevino never had an instructor or coach, stating he never met one he couldn't beat on the golf course. A major avenue in El Paso, Texas, was named after him, and streets in Rio Rancho and Belen, New Mexico. He co-authored his autobiography, titled They Call Me Super Mex. In 2000, Trevino was ranked as the 14th-greatest golfer of all time by Golf Digest magazine. Trevino has also said: "I've been hit by lightning and been in the Marine Corps for four years. I've traveled the world and been about everywhere you can imagine. There's not anything I'm scared of except my wife." Trevino has called his wife, Claudia, "his rock." He also credits her with jumpstarting his career again when he considered retiring due to old age, saying "those clubs don't know how old you are." In Trevino's early career, much attention was given by the press to a plastic "BandAid" he wore on his forearm to cover a tattoo of the name of his ex-wife. He has since had this tattoo removed by a plastic surgeon using a laser technique. Trevino had a cameo appearance in the 1996 comedy Happy Gilmore. 9 Jul 4, 1971 Canadian Open −18 (73-68-67-67=275) Playoff Art Wall, Jr.
^ Kirkpatrick, Curry (December 20, 1971). "Sportsman of the year: a common man with an uncommon touch". ^ McDermott, Barry (August 27, 1984). "It's an old man's game after all". ^ Yocom, Guy (July 2000). "50 Greatest Golfers of All Time: And What They Taught Us". ^ Apfelbaum, Jim, ed. (2007). The Gigantic Book of Golf Quotations. Skyhorse Publishing. ^ Carter, Bob. Merry Mex" was golf's showman""". ESPN. Retrieved August 4, 2013. ^ Kelley, Brent. 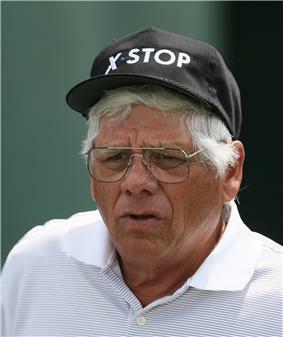 "Lee Trevino". About.com. Retrieved January 15, 2014.